First time I tried to make salted chicken wings I boiled the wings with all the seasoning together, and ended up with overcooked wings with mushy skin. 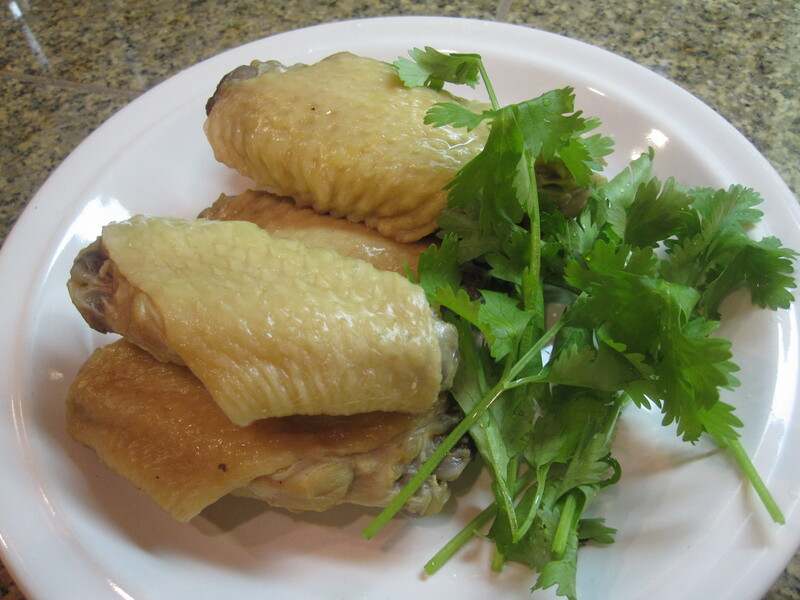 This time I decided to use the same cooking method as with my drunken chicken, and the skin is so “bouncy”. Fry peppercorns and salt in dry clean pan on medium heat until aromatic and salt starts to brown. Remove from heat for a few minutes, and add water, ginger and green onion (so that when water contact with hot salt will not create a splash). Return to heat and boil for 5 minutes. Set aside to cool. Wash chicken wing mid joint, add to boiling water on high heat. When water boils again turn down to medium heat to soft boil for 10 minutes. Turn off heat and simmer for 15 minutes. After taking out the mid joints, continue boiling down the liquid and you’ll have homemade chicken broth. Remove mid joints and transfer to a large bowl filled with ice cubes. This is to firm up the skin and thus produce a “bouncy” texture. When the skin is firm to the touch, soak them in the cooled marinade for overnight. Garnish with cilantro and serve cold or room temperature (check the wings after 6 hours of marinating. If the wings reach your desired saltiness, remove from the marinade and keep in the fridge). I marinated the wings overnight and they turned out a bit too salty to my taste, so may use less salt (3 tbsp maybe?) next time if marinating overnight. Also, I forgot to add rice cooking wine when boiling the marinade. I’m sure the wine will add more flavor. I think the marinade can be frozen and reuse for at least 2 more times.